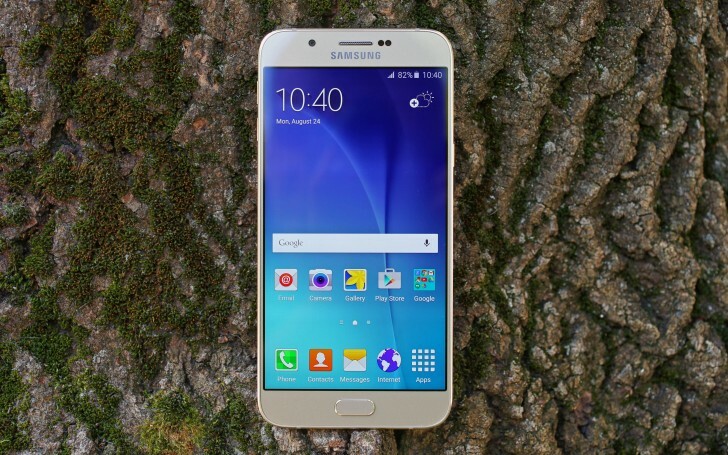 The Samsung Galaxy A8 is powered by either a Snapdragon 615 chipset or an Exynos 5430 chipset. Both have octa-core processors - two groups of four at 1.3GHz and 1.8GHz respectively. However, in the Snapdragon both groups are Cortex-A53 cores, while the Exynos uses their predecessor, Cortex-A7, for one group and a more powerful Cortex-A15 for the other. The GPU differs a lot as well, with the Exynos packing a Mali-T628 MP6, which should handle itself well at the 1080p screen resolution. The Snapdragon 615 uses an Adreno 405, which is normally found in 720p phones. Finally, the Galaxy A8 has only 2GB of RAM. That's enough for most phones, but half what the flagship Galaxy Note5 has. Before we look at the results, it's important to note that the review unit we have is the Exynos 5430 version of the Samsung Galaxy A8. Starting off with the processor speed, single-core performance lags behind the LG G4, the Cortex-A57 core it has is the successor to the Cortex-A15, but it only has two of them and Galaxy A8's numerical advantage wins out. For overall performance, AnTuTu 5 places both on equal footing while Basemark OS II 2.0 showed a lead for the LG G4. Exynos 5430 is no slouch, but it's just no match for the 7-series found in Samsung's most recent flagships. Mali-T628 is not the latest architecture but it has enough oomph for a 1080p screen. The Galaxy Note5 needs a newer Mali-T760MP8 (with more cores to boot) to achieve a similar performance at QHD resolution (keep in mind that's nearly 80% more resolution, so the raw performance difference is fairly big). Basemark X is less enthusiastic about the Mali, but it still puts the Samsung Galaxy A8 above the Oppo R7 Plus, which is powered by Snapdragon 615 and Adreno 405. Also, look at the Galaxy E7 - it uses Adreno 306 in a Snapdragon 410, the GPU is over four times slower than the Mali. In BrowserMark 2.1 it matched the LG G4 and came close to the Galaxy Note5. Again, they render at QHD instead of 1080p, but the chipset once again proves to have been the right choice for the job. We're quite happy with the performance of the Samsung Galaxy A8 with Exynos 5430. The chipset was flagship-level stuff a year ago and still holds its own. The Snapdragon 615 version of the A8, however, will struggle with 3D gaming performance as its GPU is only half as powerful as that in the Mali. Still, the processor speed should quite close for many workloads.